Remember when the dollar was worth about four cents on the euro and American tourists were paying, like, $14 for ketchup? Trying to visit more than one city across the pond seemed exorbitant to the point of comedy. But favorable exchange rates have turned the tide — the era of the dirt-cheap Euro trip is back, baby! There’s no shortage of world-class destinations you can actually afford to visit right now. Thanks to a slew of sleek new bus companies, you can actually loop around 15 of Europe’s grand capital cities for 500 bucks. Yeah, I said bus. Wanderu is that site for bus and train travel that helps you find quick trips outta town for as little as $10, and the wizards there have worked their magic with European bus lines. All have comfy seats and free Wi-Fi, and many of these routes go over water, through mountains, and down streets of quaint towns you’d otherwise never see. 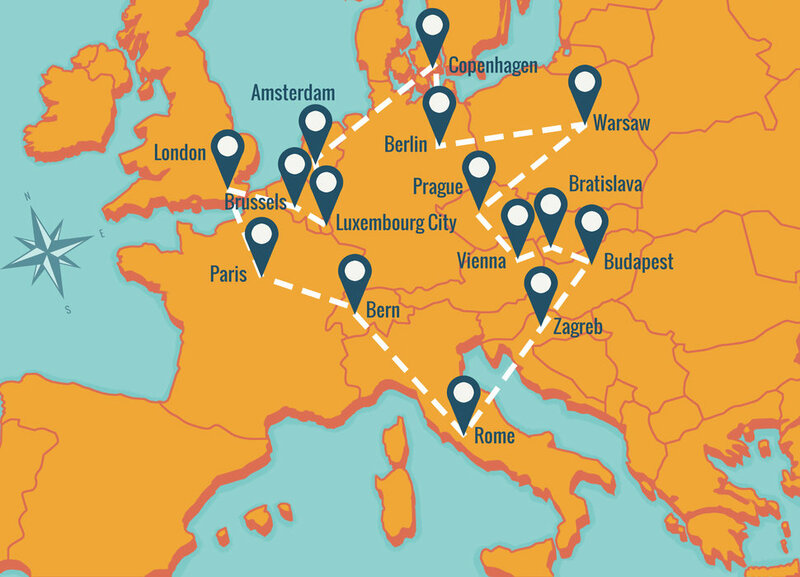 Making this not only a cheap way to see Europe, but an especially unique one. Now be forewarned: Bus fares, like airfares, change rapidly, and the prices quoted here are on the lowest end of the spectrum. Traveling during peak times or avoiding layovers might cost a few pennies more, but booking 30 days in advance guarantees cheaper rates. If you want to see Paris, London, Prague, Amsterdam, Rome, and 10 other cities for less than the cost of a plane ticket across the US, here’s how it’s done. Start your grand European tour at London’s Victoria Coach Station. 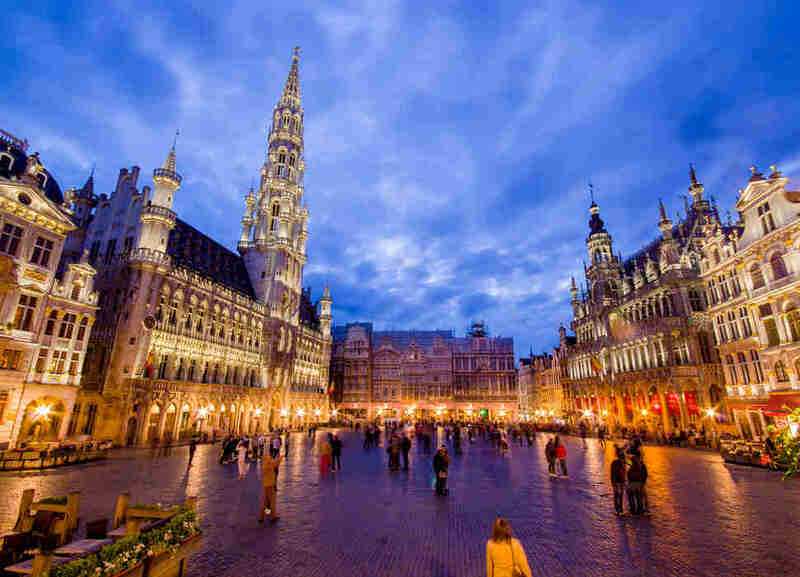 You’ll see the countryside of Southeastern England, traverse the tunnel under the English Channel, skirt the coastline of France, and travel just outside Bruges and Ghent before arriving in Brussels. There’s no better city to shelve your diet for the foreseeable future: The street carts beckon with waffles and fries, and there’s basically a chocolatier on every corner. After you’ve had your fill of the best damn beer on the planet, you won’t have a problem finding an Airbnb for less than a Benjamin per night. Don’t leave without: Spending time at the Grand Place, the historic central square. It’s lined with jaw-dropping Gothic and Baroque buildings with bars and coffee shops on the ground floors. From there you can watch the street performers put on nightly light shows in the summer. Hoard some Belgian chocolate in your bag for later and move along. This route takes you through thick German forests, with a three-hour layover to explore the riverside city of Bonn. 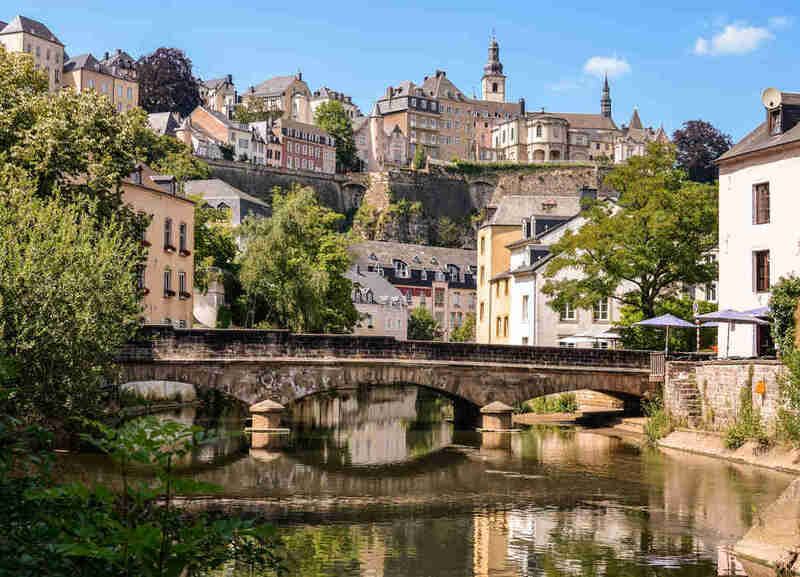 See the house where Beethoven was born, get a good look at the Rhine, and then head to the old fortressed city of Luxembourg, which is uniquely situated on plateaus amongst deep gorges. Despite being one of the three unofficial “capitals” of the EU, Luxembourg stays under the radar; you won’t find many other tourists here to muck up the experience. 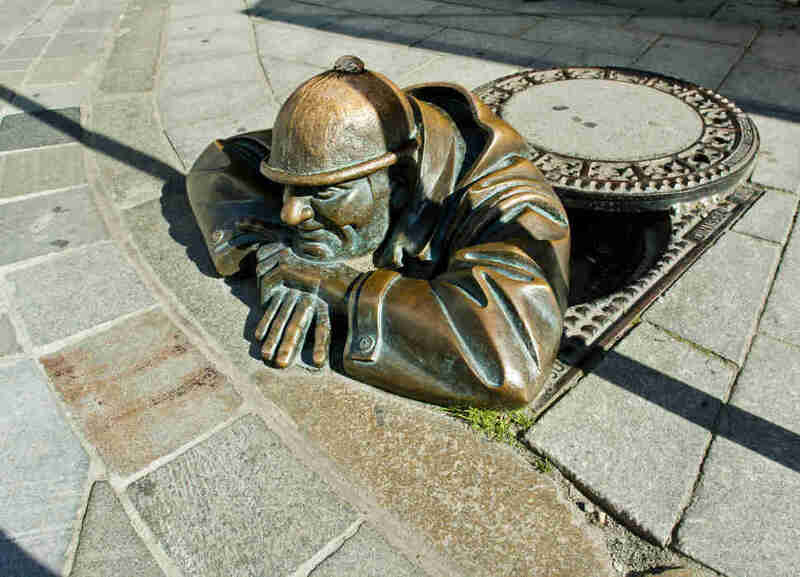 There’s plenty of historic and politico-geek stuff to see, or just wander through the tunnels, parks, gardens, nooks, and crannies of the medieval old town. Don’t leave without: Checking out the 10.5 miles of underground caves that were once used as transportation and defense for the city’s main castle. The ends of the tunnels have spectacular views that are well worth the crawl. Arrive at the infamous Dutch capital in just under seven hours. It’s ridiculously easy to do Amsterdam on the cheap: People-watch in the red light district, check out the art galleries on Nieuwe Spiegelstraat, wander into one of the city’s hidden gardens, or attend an outdoor film festival, all for exactly zero money. Don’t leave without: Joining the 800,000 other bicyclists on the road. 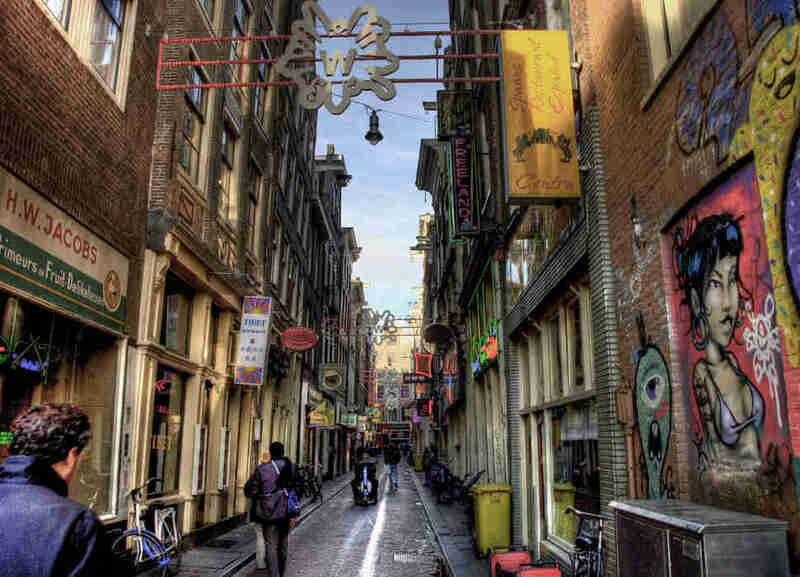 Amsterdam is one of the world’s most cycle-friendly cities, and it’s the ideal way to explore the canals, neighborhoods, and shopping districts. Then stop under the De Gooyer windmill (one of eight in the city) and enjoy a beer from the award-winning Brouwerij ‘t IJ brewery. This bus ride is an overnighter, and hopefully the sun will be up by the time you hit the Fehmarn ferry, an epic 45-minute boat ride across the Fehmarnbelt from Germany into Denmark. 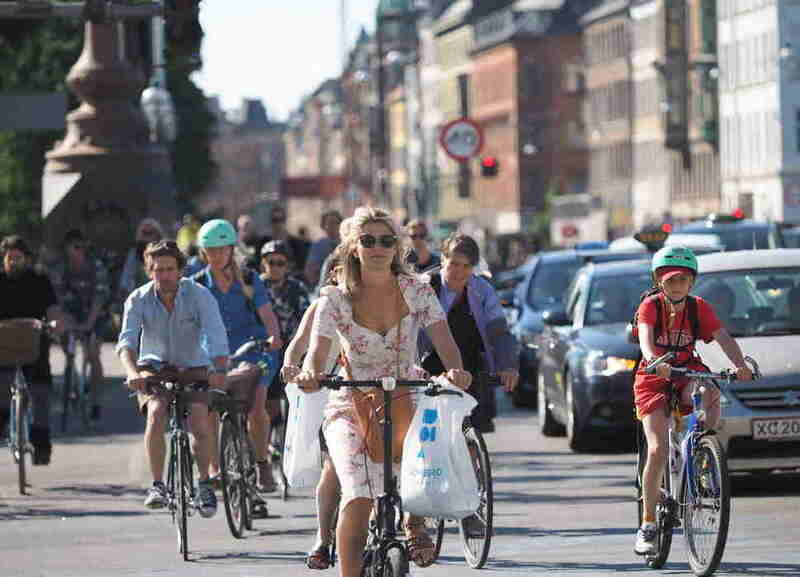 From there, you’ll pass through gorgeous Danish towns and sprawling countryside into Copenhagen. Book a bunk in advance at Urban House, the city’s hippest hostel (it has its own tattoo parlor) located in the also-very-hip neighborhood of Vesterbro. Nyhavn, Copenhagen’s waterfront entertainment district, is a good spot to end a day; it’s a gorgeous walk along the canal with no shortage of cozy bars and restaurants to duck into. There are a few different ways to book this leg. 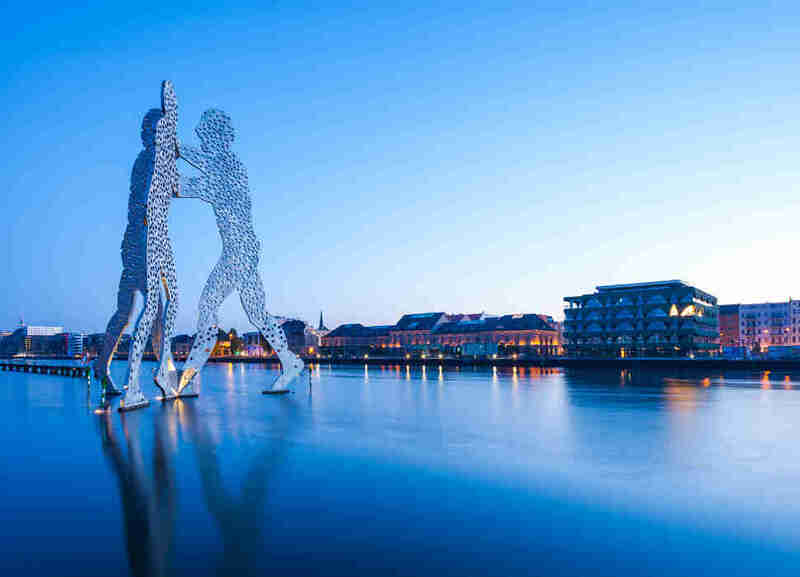 You can enjoy the Gedser-Rostock ferry, a scenic one-hour, 45-minute ride across the Baltic Sea, or take a longer trip that includes a few hours’ stopover in Hamburg. But the cheapest overnight route will have you in Berlin by 8:30am. Best to get an early start. 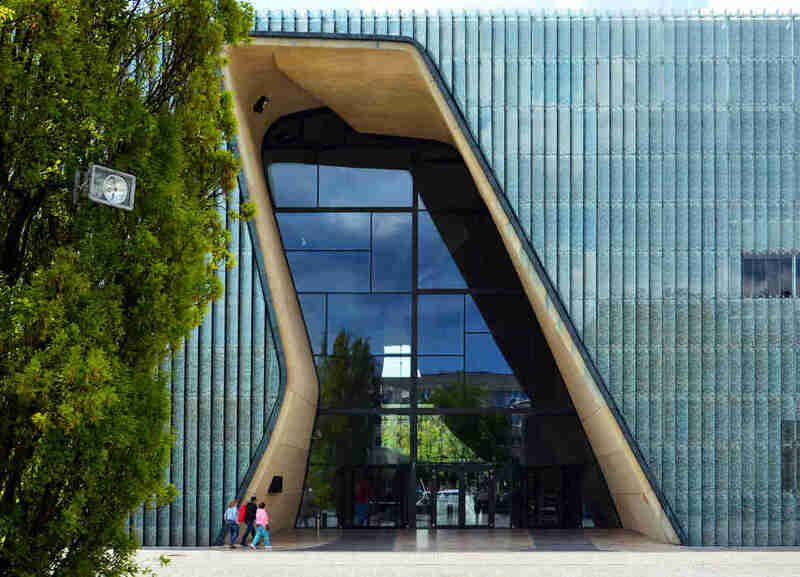 This might be the most architecturally interesting capital in Europe — you’ll see brutalist Communist-era buildings set near Gothic, Baroque, and Roman structures. 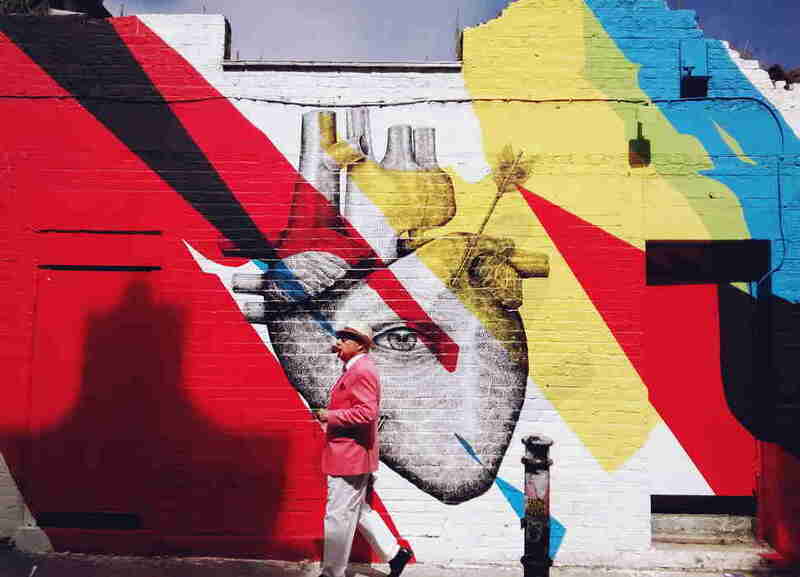 It’s also fun as hell and an absolute dream for travelers on a budget: cheap Airbnbs, cheap beer, free street art, beautiful parks, legendary nightlife, and young, English-speaking locals happy to show you around. The bus leaves from either the Berlin Central Bus Station or Schonefeld Airport, so starting your journey with a flight to Berlin is also an option. Next stop is Poland, another one of those charming dirt-cheap countries that not enough Americans visit. In Warsaw you’ll find super-affordable digs and eats — even a fancy six-course meal can be had for a reasonable $70. There’s a long and fascinating history here; Warsaw has been marvelously rebuilt since its World War II occupation, and while trips to the Jewish section of town and the Uprising Museum show you exactly how far this city has come, nowhere showcases it better than Old Town. 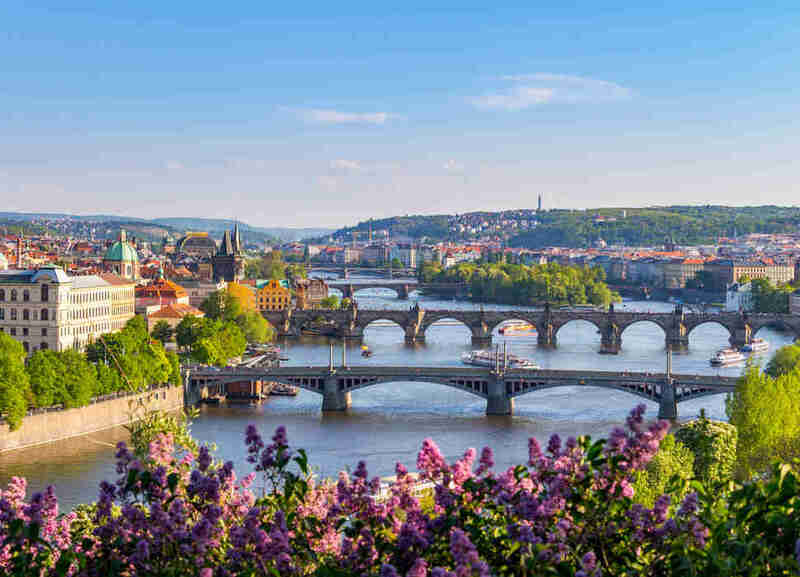 It’s a long road to Prague, with a trip through Dresden along the way, but it’s well worth it once you arrive at one of the most mind-blowingly picturesque cities on Earth. Europe’s “City of Spires” certainly has some grand architecture, and taking a day or two to inspect it all, along with Prague Castle, is definitely worth it. But Prague has also shot to the top of the European nightlife scene, so save some energy and get in on the action. For club goers, head to the nuclear bunker-turned-nightclub at Bunkr Parukarka. If dives are more your scene, head out to Zizkov, where 300 bars are packed into two square miles. Don’t leave without: Walking across the incomparable 15th-century Charles Bridge — preferably at sunrise, when its ethereality isn’t lost in the throngs of tourists. Order some late-night smažený sýr (breaded fried cheese) off a food cart and have your fill of cheap Czech beer. Vienna ain’t cheap, but hanging here feels fancy and indulgent even if you aren’t dropping a ton of money. It’s classy, cosmopolitan, chock-full of attractive humans, and one of the most spectacular architectural cities in Europe. In particular, check out the Secession Building, an iconic example of Vienna’s turn-of-the-century art nouveau movement, and the popular Hundertwasser House, a quirky colorful apartment complex. 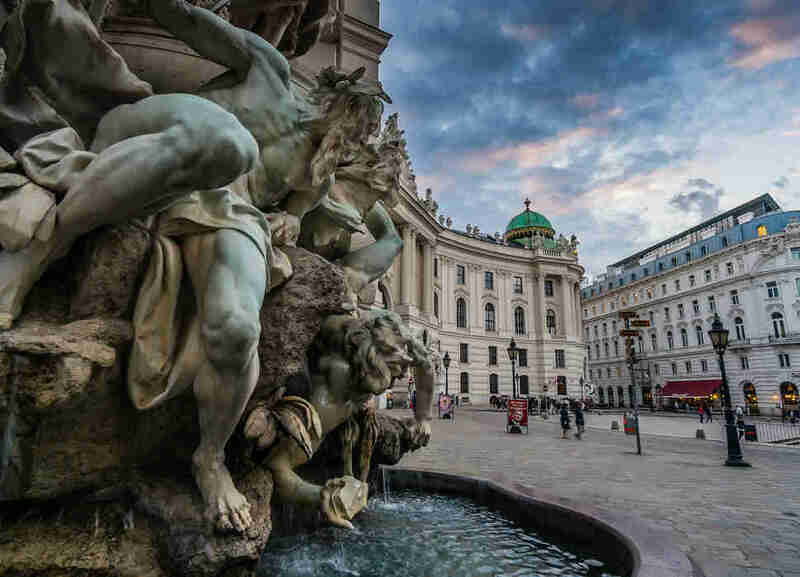 Don’t leave without: Vienna, once the seat of the Habsburg empire, is home to some of the most ornate palaces in the world, so be sure to hit up the Schönbrunn Palace, a one-time hunting lodge that boasts gardens on par with those at Versailles and is home to the oldest zoo in the world at Tiergarten. Because Vienna is often the airport of choice for those flying to Slovakia, there’s no shortage of cheap busses going from the Austrian capital to Bratislava (just make sure you take the bus to Most SNP station, not to the airport). It’s only a few minutes’ walk to the city center where you’ll find one of Europe’s best-kept secrets for divine food and laid-back vibes. This might be the most historically charming European capital you’ve never heard of. Colorful, classic old structures line the Danube, and Bratislava Castle stands like a sentinel over the city. Don’t leave without: Browsing the shops at Eurovea, then walking along the Danube River into the historic old town center. Get some coffee and cake and take in the scenery. If you can, take the bus that leaves Bratislava at 10:20am; not only is it the cheapest, it also gets you into Budapest with enough time for a full evening in town. 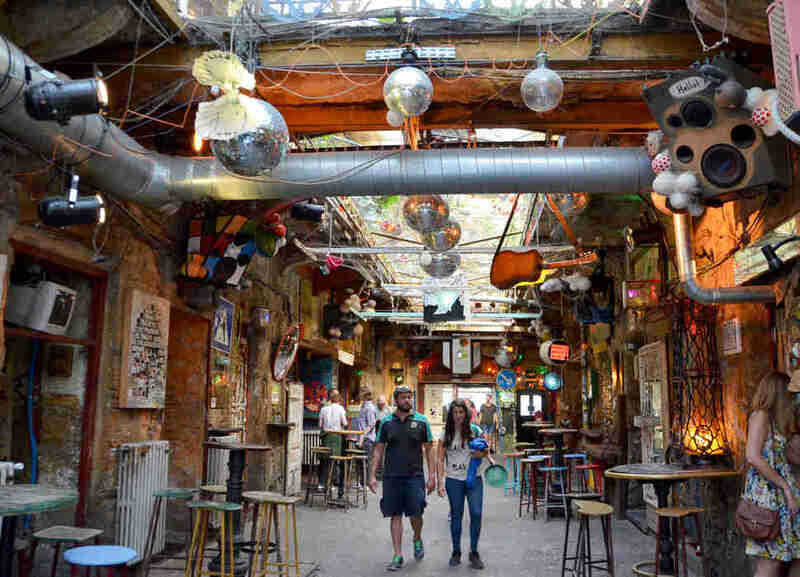 Spend it at one of Budapest’s famous ruin bars like Szimpla Kert, a former abandoned factory that has quirky themed rooms where old junk like bathtubs and car hoods serve as your bar stool. This city feels romantic and old-school, with jovial locals and plenty of Airbnbs to be found for shockingly little. Get a gorgeous panoramic view from the city’s highest point, Gellért Hill, an easy 30-minute climb on the Buda side. Don’t leave without: Taking an afternoon to relax those travelin’ bones in one of the city’s natural thermal hot baths that date back 400-500 years. Day pass entrances start around $15. 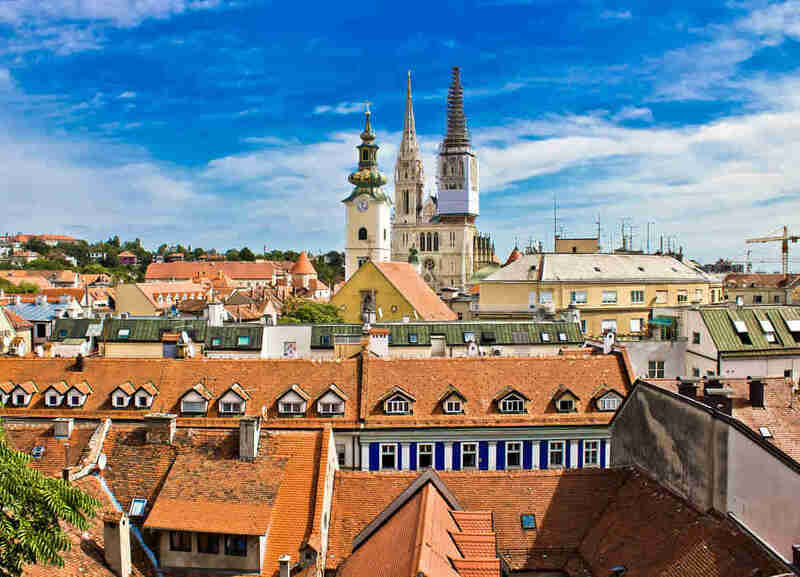 After a ride through rolling hills and charming little towns in Northern Croatia, you’ll arrive in Zagreb. Tourists usually skip Zagreb and head straight to the Adriatic Coast, which is a shame. 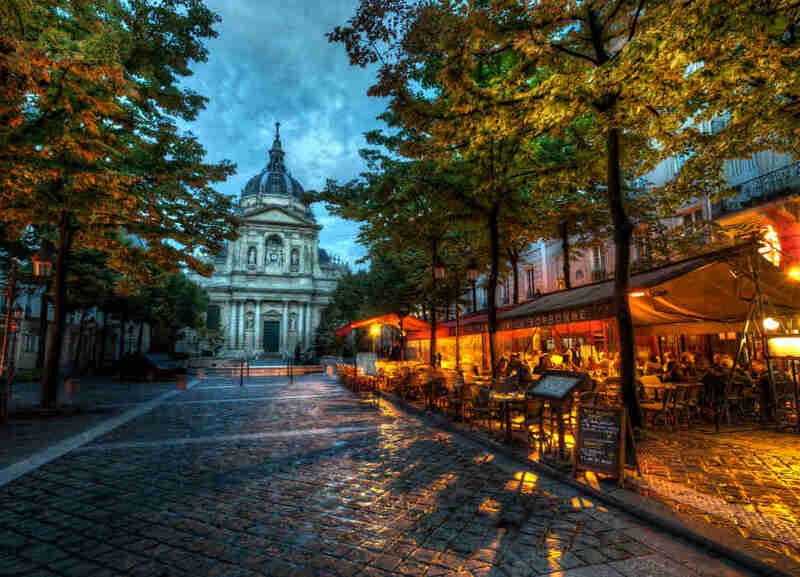 Beyond the historic cathedrals and charming cobblestone streets of the old town, you’ll see a quirky mishmash of architectural styles and all the makings of a modern cultural capital — chic bistros, wine bars, jazz clubs, art galleries, counterculture bookstores, and specialty shops. Walk down Martićeva St and you’ll see what I mean. Don’t leave without: Visiting the Museum of Broken Relationships, just one of Zagreb’s several offbeat museums. This one-time traveling exhibition is full of letters, gifts, and stories of failed romances, both heartbreaking and hilarious, and makes for an excellent quirky diversion. This trek is worth it for the spectacular mountain scenery in Slovenia that you’ll pass on the way to Milan, where you’ll have two hours in the evening to grab a bite. Think of that as an appetizer for the gastronomic delights that await you in the Eternal City. No worries if you blow your budget on heaps of fresh pasta and wine; Rome is basically an open-air museum of piazzas, fountains, and markets that are completely free to browse. This might be the one city in the world you’d never be able to finish exploring, and time is limited, so don’t waste it standing in line for the Colosseum. 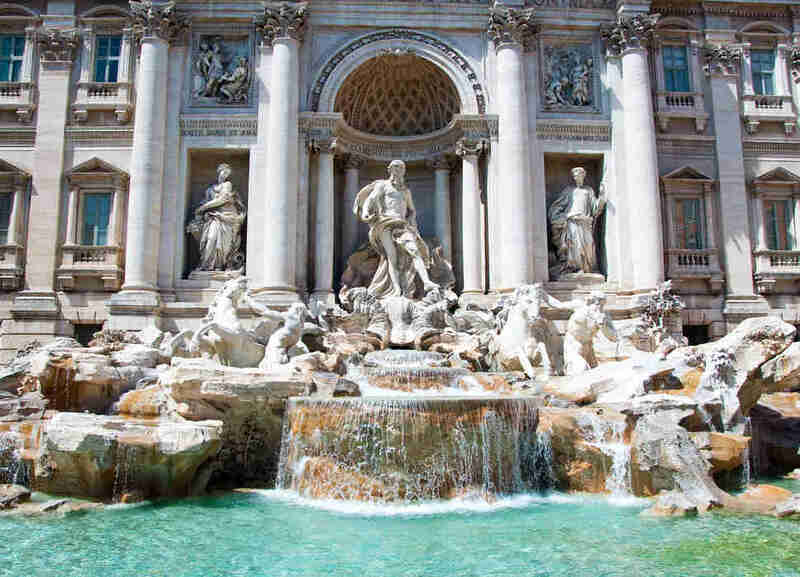 But you will want to brave the heavy tourist crowds to throw your coin in the Trevi Fountain. 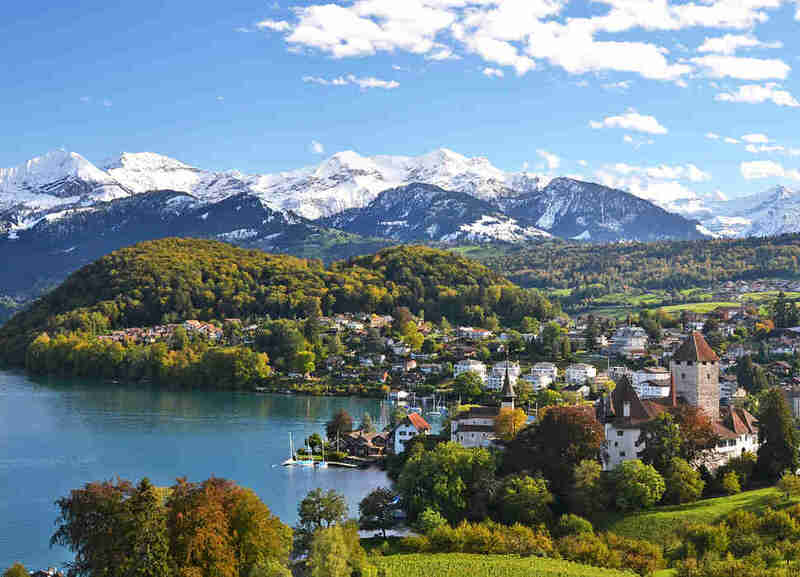 After a hearty German breakfast during a two-hour stopover in Munich, you’ll see some nice mountain views and chalet-lined streets of small Swiss towns on your way to Bern. The picturesque Swiss capital is set on the Aare River against the towering Alps. If the weather craps out, there’s no shortage of museums here — two major art museums, an Einstein museum, and a communication museum. But if the weather is nice, you’ll want to wander down the banks of the Aare and take in all that majestic beauty. Don’t leave without: Visiting the BearPark. The bear is Bern’s city symbol, and it pays tribute to these fierce behemoths with a large swath of land that runs along the Aare River, where you can watch the bears playing on the grassy hillside, bathing in the river, and hiding in their caves. The first leg of this trip is absolutely gorgeous; you’ll ride along the shores of Lac Léman and through Geneva, stop for dinner in Lyon, then arrive in Paris at daybreak. (Just make sure you take the bus to Porte Maillot. Port Orleans buses cost twice as much, and busses to De Gaulle airport will leave you with an hour-long train ride into the city.) Head straight to the Latin Quarter — though it’s a bit touristy, it’s still packed with fragrant bakeries that will serve you the most impeccable croissant-and-coffee combination of your life. You can cross that off your Paris culinary bucket list; spend the remainder of your trip trying to knock off as many dishes as humanly possible. Don’t leave without: Taking a stroll along the Seine. Paris can be overwhelming to do in a short period. If you’ve got limited time, take the Metro to the Eiffel Tower, get a nice long look at it (and the massive line to go up), then stroll along the Seine River back towards the Latin Quarter until you arrive at the Cathedral of Notre-Dame. And so your grand European tour comes to its close. If you’ve saved some money, celebrate with a pint in one of the city’s many venerable watering holes, or by burning your face off at a curry house. If you’re broke as a joke at this point, there’s plenty to do in London for not that much money. Don’t leave without: Jumping on a double-decker bus tour. As one of the most historic cities in the world, picking between the changing of the guard at Buckingham Palace, a stroll through Piccadilly Circus, or selfies of you pushing over Big Ben can be a tough decision. So if you’ve got limited time, you can knock out Buckingham Palace, the Tower of London, Westminster Abbey, the Eye, and all the other sights you’ll be expected to post pictures of in one swing. After a journey like that, you’d be forgiven to do things to easy way.